4 John, to the seven congregations which are in Asia: Grace be unto you and peace from him who is and who was and who is to come and from the seven Spirits which are before his throne 5 and from Jesus, the Christ, who is the faithful witness and the first begotten of the dead and the prince of the kings of the earth. 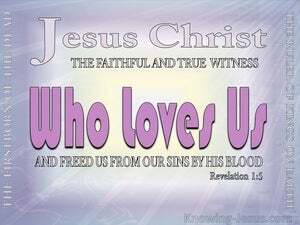 Unto him that loved us and washed us from our sins with his own blood 6 and has made us kings and priests unto God and his Father; to him be glory and dominion for ever and ever. Amen. Also I will make him my firstborn, high above the kings of the earth. And he is the head of the body, the congregation , who is the beginning, the firstborn from the dead, that in all things he might have the preeminence. These shall make war against the Lamb, and the Lamb shall overcome them; for he is Lord of lords and King of kings; and those that are with him are called and chosen and faithful. 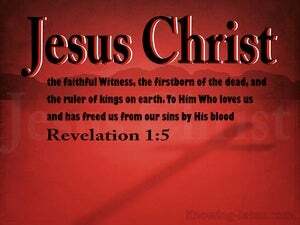 And he has on his garment and on his thigh a name written, KING OF KINGS, AND LORD OF LORDS. that the Christ should suffer and that he should be the first that should rise from the dead and should show light unto this people and to the Gentiles. Nevertheless the LORD thy God would not hearken unto Balaam, but the LORD thy God turned the curse into a blessing unto thee because the LORD thy God loved thee. His seed shall endure for ever and his throne as the sun before me. By me the kings reign, and the princes decree justice. Then the king commanded to call magicians, astrologers, enchanters, and Chaldeans, that they might show the king his dreams. So they came and presented themselves before the king. And he gave him dominion and glory and kingdom; and all the peoples, nations, and tongues served him: his dominion is an eternal dominion, which shall not pass away, and his kingdom such that it shall never be corrupted. In that time there shall be an open fountain for the house of David and for the inhabitants of Jerusalem against sin and against uncleanness. And Jesus came and spoke unto them, saying, All power is given unto me in heaven and in earth. Now before the feast of the passover, when Jesus knew that his hour was come that he should depart out of this world unto the Father, having loved his own who were in the world, he loved them unto the end. Peter said unto him, Thou shalt never wash my feet. Jesus answered him, If I wash thee not, thou shalt have no part with me. As the Father has loved me, so I have loved you; abide in my love. Take heed therefore unto yourselves and to all the flock, in which the Holy Spirit has placed you as bishops to feed the congregation of God, which he has purchased with his own blood. Nevertheless, in all these things we are more than conquerors through him that loved us. But now Christ is risen from the dead and become the firstfruits of those that slept. I am crucified with Christ; nevertheless I live; yet not I, but Christ lives in me, and the life which I now live in the flesh I live by the faith of the Son of God, who loved me and gave himself for me. and walk in charity even as the Christ also has loved us and has given himself for us as an offering and a sacrifice to God for a sweet smelling savour. how much more shall the blood of the Christ, who through the eternal Spirit offered himself without spot to God, purge your conscience from the works of death to serve the living God? But if we walk in the light, as he is in the light, we have communion with him in the midst of us, and the blood of Jesus Christ, his Son cleanses us from all sin. In this does the charity consist, not because we had loved God, but because he loved us and has sent his Son to be the reconciliation for our sins. For there are three that bear witness in heaven, the Father, the Word, and the Holy Spirit; and these three are one. And I said unto him, lord, thou knowest. And he said to me, These are those who came out of great tribulation and have washed their long robes, and made them white in the blood of the Lamb. And the seventh angel sounded the trumpet, and there were great voices in the heaven, saying, The kingdoms of this world are reduced unto our Lord and to his Christ; and he shall reign for ever and ever.